I can attest that the current state was colorful - lots of yarn going long distances to questionable destinations. Karen really helped make the mess visible! A good starting point. As an old systems hack I am not surprised but applaud your efforts so far. Hyperlink pages evolve and often lose their original intent. There should have been a specific script and walk through of how the visitor would navigate the web site. In the programming world they call it "Use Cases" but in the older days we called it "prototyping." Those simple scenarios should be documented by the design/web team. If not, don't redesign it without understanding how the visitor will perform various functions. When we redesigned, we created paper prototypes and asked members to come and simulate use and give us feedback. That resulted in some tearing-up and redesigning. If not for the prototyping, we would not have done a good job. 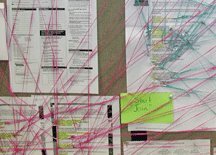 Your article reminded me of how effectly we used yarn at Lantech to see the linkages and differences in different product flows. We made a huge map on the wall with each of the main options for each Process, and then took individual customer orders and showe how they flowed through the process. As we did order by order, it became really obvious what our different value streams were, and were able to create really good vision of the diffent value streams to create. Wish I had picture of it. But it was watershed event in our lean journey!